The ski school is located in the village of Padam, the capital of Zanskar, and was officially opened in April 1998. The school uses over 100 pairs of skis and poles, donated from Europe and North America. Amin Zanskari is the Director of the Ski School, and Urgan Dorjay is the Lead Instructor and Manager of day-to-day operations. Urgan is sometimes assisted by volunteer Western instructors. Where are the skis kept? The ZSS has a ski store, known as "Shangku Shelter", in the village of Khangok, up the hill from Padum. The lower floor houses 200+ pairs of skis and has an indoor bouldering wall. The upper floor is under construction and will have accommodation for guest instructors, and meeting area. Where do the skis come from? The skis have all been donated from Europe and North America. Åsnes, the Norwegian ski manufacturer, made an important contribution of children's' skis and Canadian Mountain Holidays (CMH) provide equipment when available. We are actively collecting equipment to expand the school inventory. The ski school concentrates on teaching cross-country skiing (Nordic) or back-country skiing (Telemark and Alpine Touring), as these are the most useful for getting around. Keep in mind, there are no-ski lifts in Zanskar! Who is learning to ski? Any local Zanskari can take a week-long ski course for a small fee, to cover maintenance of the gear and instructor salary. On completion of the course, local people may borrow skis for a week or more. To date, over 200 people have taken the course, and it has been particularly popular with kids. Local doctors and policemen regularly borrow skis, to visit other villages throughout the valley. 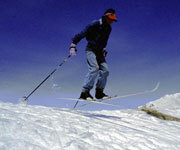 In future the ZSS aims to enter students from Zanskar into the national ski competition, held every year in Gulmarg. Our long term goal is the Olympics! We are continually trying to encourage more female students to learn to ski and particularly welcome female guest instructors. In the future we would like to arrange for some Zanskaris to learn better ski instruction and snow safety techniques from a European or North American school.